Forrex 150 is a iron supplementation that is used in the treatment of iron deficiency such as iron deficiency anemia. It makes a positive balance of iron which is a essential minerals.Iron is necessary for many functions in the body including formation of hemoglobin, brain development, regulation of body temperature, muscle activity and many more. Lack of iron directly affects the immune system, decreases number of T-lymphocytes production of antibodies. 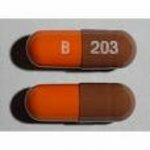 There is hardly any drug which has no side effect but Forrex 150 is prescribed due to its therapeutic efficiency. Very effective against iron deficiency.